What Did We Learn from the Collapse of I-85? Atlanta is full. Like, really, really full. There are A LOT of us in this town. 5,789,700 to be more exact (that is all of metro-Atlanta, of course). And the collapse of I-85 forced us to experience just how bad traffic can be as we continue to overcrowd our roads and highways. MARTA: We don’t typically utilize public transportation like other large metropolitan cities do. Ridership increased 11.5% overall after our beloved interstate came crumbling down. The top three stations with the biggest increases in passengers were Brookhaven (67%), GA Dome (57%) and Sandy Springs (43%). Uber even offered discounts to passengers traveling to Marta stations in order to encourage more Atlantans to utilize our public transportation system. INCENTIVES: It should not come as a shock to anybody that dangling an extra 3.1 million dollars in the face of the company contracted to repair the bridge aided in a quicker completion. It’s estimated that the total cost of the reconstruction of the bridge was 16.6 million dollars with the federal government ponying up a total of 10 million. Officials originally announced that it would take until mid-June for the project to be completed, but thanks to some extra cash and hard workers, it only took 6 weeks to get Atlanta moving again. 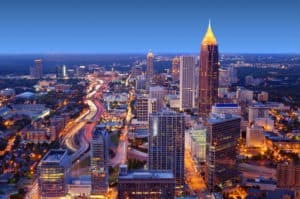 GROWTH: If you haven’t already heard, Atlanta is rapidly growing. By 2040, we are expected to increase our population by 2.5 million people. That’s a lot of bodies. Where will everyone go? Many people are hopeful that after others have realized that Marta is efficient this will alleviate current traffic conditions and encourage future residents to take advantage of our buses and trains. After all, approximately 250,000 people are currently traveling on I-85 on a daily basis. What will that number be in years to come? So, don’t you want to live close to where you work and play to avoid spending the majority of your life in your car? Call us at The Peters Company and we will get you situated in just the right place!